Fourteen years ago, a junior sailing instructor scared Nick Woviotis with stories of giant fish and other creatures that would get him if he capsized his boat. On his second day at camp, Nick flipped his boat, but after floating in the water as he waited for help, he realized it wasn’t that bad. He was nine years old, and he’s been sailing ever since. Nick didn’t own a boat or belong to a sailing program, so he figured out ways to get on the water. He relied on the community around him, who not only gave him the chance to sail with them, but helped him start his own sailing team. Five years ago he officially launched the Dragon Sailing Team as a way to help kids like him: passionate about sailing, but without a boat. They started with a borrowed Cal 28, learning about diesel systems, navigation, electronics, and other fundamentals. 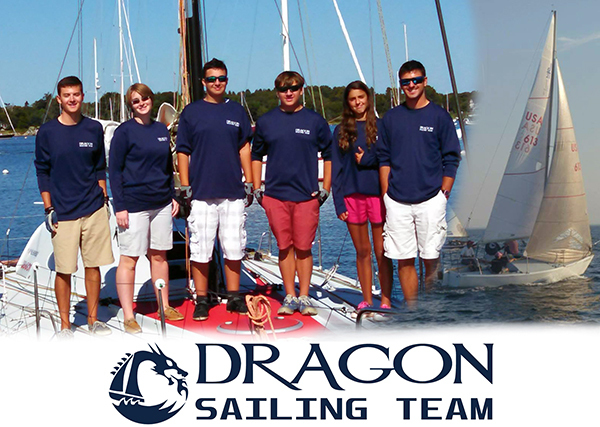 Earlier this year, they bought their first real racing boat – a J/24. After a great first season, Nick wants to keep his team motivated, so they came up with an ultimate challenge. Not only do they want to spend at least 100 days racing in the next two years, they want to enter bigger regattas, like the Marblehead NOOD, East Coast Championship, and their ultimate challenge goal – qualifying for the 2017 J/24 World Championship. When I was nine years old, I hated my first day of sailing: I was afraid of the water, I hated the boom, and I couldn’t stand the constant cuts and bruises I received from the boat. On the second day, I capsized my little Dyer Dhow. In that moment sitting in the water waiting for rescue, I realized the water wasn’t so bad, so I stuck with it. Over the next fourteen years I learned how to sail and how to race, and I began excelling in scholastic, collegiate, and summer sailing programs. But during those fourteen years I never owned a boat, nor was I ever a member of a yacht club or enrolled in a sailing school. I was self-taught and completely dependent on finding rides from whomever I could ask and annoy. Now I’m happy to say I finally picked up an old J/24, but I don’t race it with the intention of becoming the best sailor in the world. Instead, I look back at my sailing career so far and I’m thankful for the opportunities I was given, but I also realize how incredibly lucky I’ve been with all of the sailing I was able to do. So now, fourteen years after I capsized my borrowed Dyer Dhow, armed with med with a J/24 and poised to take on any event or campaign I want, my mission is to give youth the same opportunities that I fought for as a kid. There have been too many times I’ve seen promising young sailors left at the docks because they didn't own a boat, their parents didn’t know the right people, or they didn’t qualify for a sailing scholarship at a community sailing center. I’ve met teenagers that talk about sailing with passion and excitement, only to follow up with if only, as if their lifestyle differences mean they can’t enjoy the sport in the same way. If I see someone with a passion for sailing, a drive to do the best they can, and a willingness to learn more, I let them sail. On my boat, I never turn anyone away, even if they are a beginner. I have a roster of 15 sailors on my team from ages 14 -23 and all skill levels, some of whom joined as beginners a few years ago and are now sailing in national dinghy championships. I am proud to say that, in addition to a skipper, I am a coach and mentor to my team, and I stand behind them during any win or loss because I know they are gaining valuable experience they will call on later in life. However, I need to do more than just give young sailors an opportunity to sail. Like any good team, we need something to fight for. Our goal over the next two years is to take on local, regional, and national sailing championships that include everything from NOOD regattas, to the Mallory Cup, to the East Coast Championships, the J/24 North Americans in 2016, and qualifying for the 2017 World Championship. Our challenge is to race over 100 days in local, regional, and national sailing events over the next two years. Is this ambitious? Yes. But we have a team of young potential talent that is on fire and itching to show their mettle, and we have a sailing community that wants to see a new generation of sailors succeed. Maybe new sails will make a difference. They certainly wouldn’t hurt. But regardless of the outcome, we are going to dive into our next challenge head first. Maybe we’re fighting an uphill battle, but like our team motto says, "We will not go down without a fight."